With the recent discussion of the ISS having to dodge some space junk, many people's attention has once again focused on the amount of stuff in orbit around our planet. 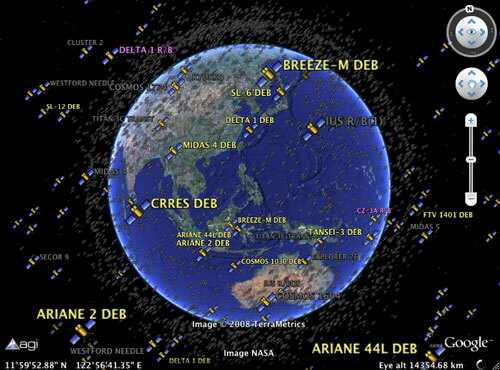 What many people don't know is that USSTRATCOM tracks and publishes a list of over 13,000 objects that they currently monitor, including active/retired satellites and debris. This data is meaningless to most people, but thanks to Analytical Graphics, it has now been made accessible free of charge to anyone with a copy of Google Earth. 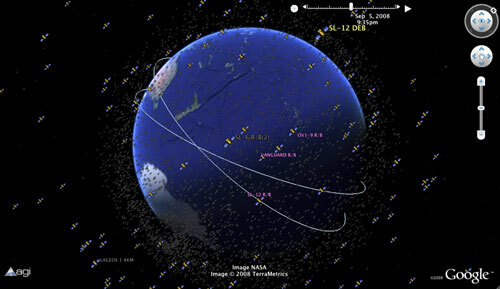 By grabbing the KMZ, you can not only view all objects tracked in real-time, but you can also click on them to get more information on the specific satellite, including viewing its orbit trajectory. It's an excellent educational tool for the space-curious. It would be even better if it took to to where a certain satellite is if you search for it's name in Google Earth.. This is something you can do with this NASA tool. Correct. And the NASA J-Track 3D version is more 'real time' than the Google Earth plug in. It has the option to update every 1/4 of a second. It also will give you info on the satellites. I like that Vanguard 1 is still up there waltzing around the earth. On the other hand, according to NASA's site, J-Track 3D "only" offers a database of over 900 satellites, whereas Google Earth with the ATK database tracks over 13,000. Also, as you can load weather data into Google Earth, so you can not only track where the satellite is, but gauge visibility. Information that people would have killed for 40 years ago!